On Thursday morning she flew a plane from Prescott to Scottsdale airport with the other girls in the camp. Then they toured an old airplane graveyard. So glad this wasn't the plane they were flying. This one has many important parts missing. Chloe and her friend by a tail fin. ....And in front of a large, green wreck. She arrived home on Friday night, very happy to be home. She's a vegan and their "vegetarian meals" consisted of a large block of uncooked tofu with soy sauce dumped on it. Before she returned, on Friday afternoon we watched Phoebe in her month long theater camp's production "Honk". Unfortunately our camera was with Chloe at her Aviation camp, but she was fabulous! 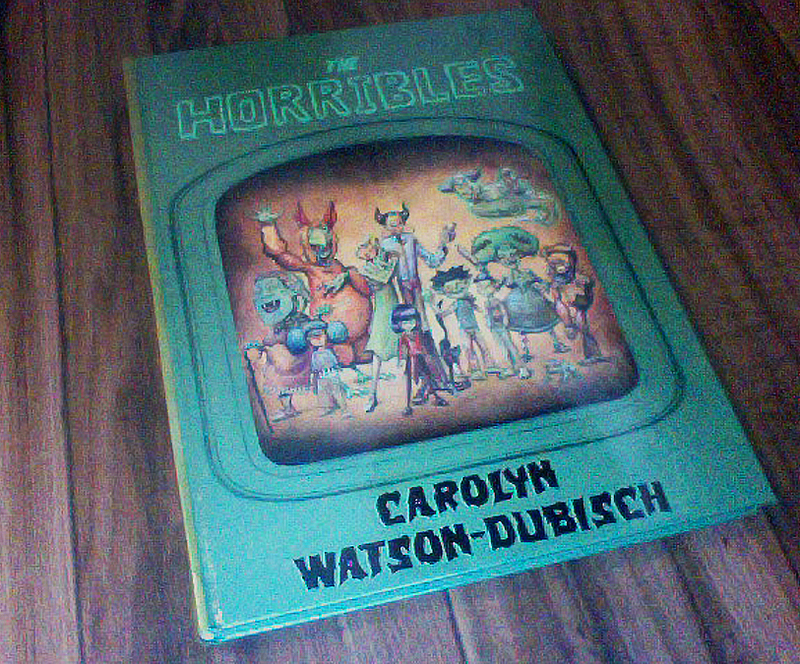 It's a huge hardcover of my entire comic series "The Horribles" with a fabulous cover by Mike (Dubisch)!!! I was thrilled to be able debut it at LepreCon where we had a booth last weekend. It was a smaller local con, but we met people, sold books and had a good time. On Sunday night after the convention we brought Naomi out to A.S.U. in Tempe for a sleepover, summer film camp in the college dorms. We set her up in her own private room (with a view) for the week. She wrote us to let us know that she was elected to be the director for the film her group was making! I hope it's going well, I guess we'll see on Friday. This week I also finished this painting last week for my upcoming solo show in August. It's one of just a few paintings (the rest are sculptures) that will be in the exhibit. It's called "20,000 Leagues Under The Sea" and is painted on a shaped wooden panel. Have an excellent week!